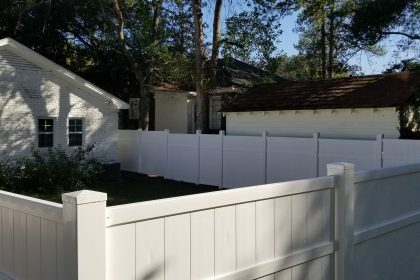 Chatham Property Maintenance Is a family owned and operated Savannah Vinyl Fence installation & repair contractor since 2009, located in Savannah, GA. We specialize in residential and commercial fence services and can service all your fence needs, new installation and vinyl fence repair needs. Proudly serving residential & commercial fence customers in Savannah since 2009! 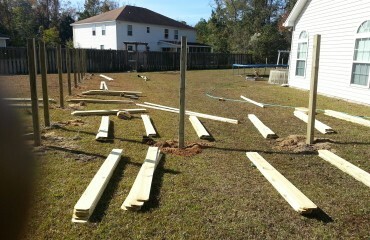 If you need an experienced Savannah fence contractor call 912-988-3832. We’ll be happy to assist you with your vinyl fence, new installation or fence repair needs! Chatham Property Maintenance is fully insured and licensed to do fence and handyman work in Savannah, Pooler, Richmond Hill, Rincon, Guyton, and surrounding areas. If you have a damaged vinyl fence, need a complete vinyl fence installation, contact Chatham Property Maintenance. 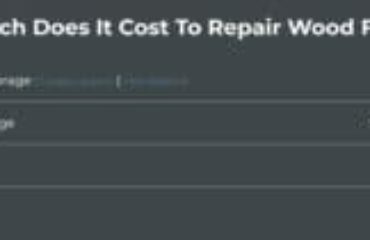 We offer thorough new vinyl fence installation estimates and free repair/replacement fence estimates to our Georgia clients. Chatham Property Maintenance specializes in Residential and Commercial vinyl fence installation repair and replacement. Providing Savannah, Pooler, Richmond Hill, Rincon, Guyton, Wilmington Island, and surrounding cities with fence services. Call Chatham Property Maintenance whether you need fence inspection, routine maintenance or a whole new fence installed.